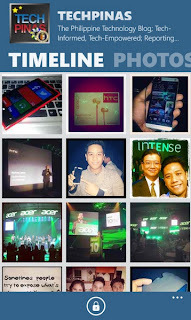 Download Instagram Client for Nokia Lumia Smartphones and Other Windows Phone 8 Handsets : Free Itsdagram Trial Version, Out Now! 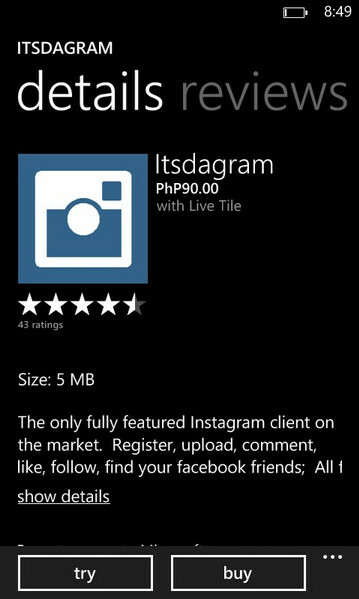 If the lack of Instagram app in the Microsoft Marketplace is one of the main things that keep you from jumping ship from iOS or Android and switching to a Nokia Lumia handset or any other Windows Phone device like Huawei Ascend W1, then you'd be glad to know there's now a full-featured Instagram client for WP8 up for download! 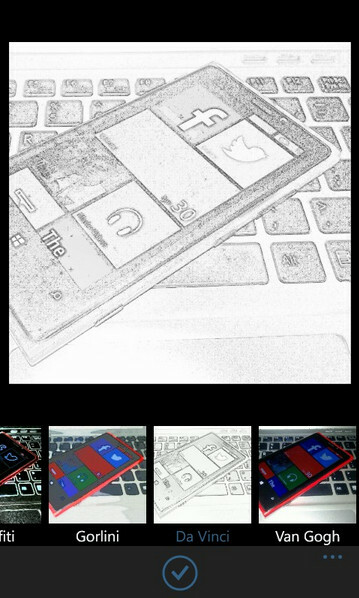 Itsdagram is so good a client that - I think - it can actually pass off as the official Instagram app for Windows Phone. 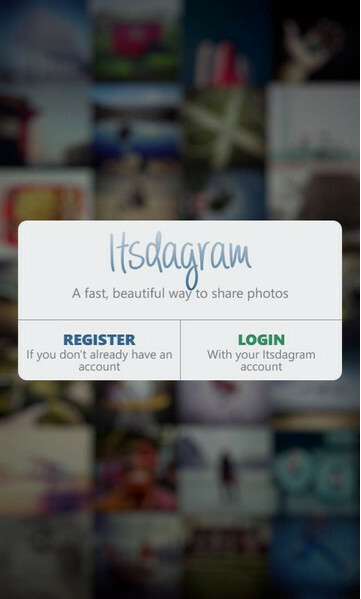 I mean, it gives you almost everything that you can get from Instagram from iOS and Android in a neat, unique, and perhaps more intuitive interface. 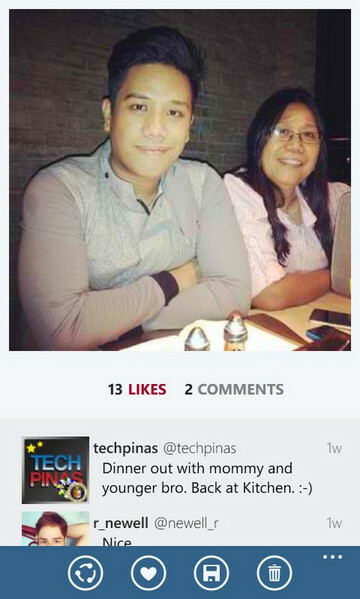 You can instantly like and comment on photos straight from your Home feed. Clicking on the Camera button at the bottom of page launches your phone's photo album where you can pick the shot that you want to apply a filter to and share on Instagram. If you wish, you can click on the capture button located below the albums, which launches the camera app allowing you to capture and share images on the spot. 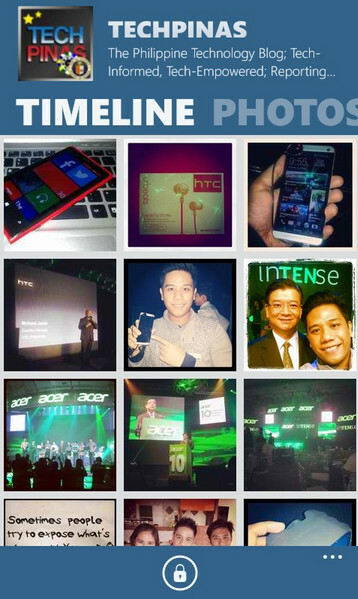 Itsdagram Profile page comes with this really cool and uncluttered layout. You just need to swipe to either sides to go from one panel or section to another. 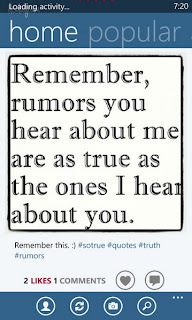 This page contains your profile, timeline, your photos uploaded by other users, likes, list of Instragramers you follow, and list of IGers who follow you. 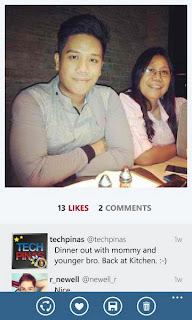 When you click on a photo from any user profile, you are given the option to share the image on Facebook and Twitter and to even include a message or edit the privacy or audience setting on FB. One thing I want to note though is that Itsdagram won't give you the same gorgeous filters that you get on the official Instagram app. 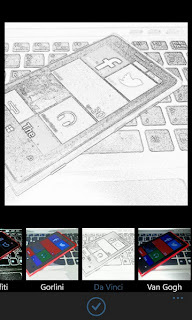 The developer, Mr. Daniel Gary, came up with his own filters including Daydream, January, Hobbes, Da Vinci, and Van Gogh, among others. 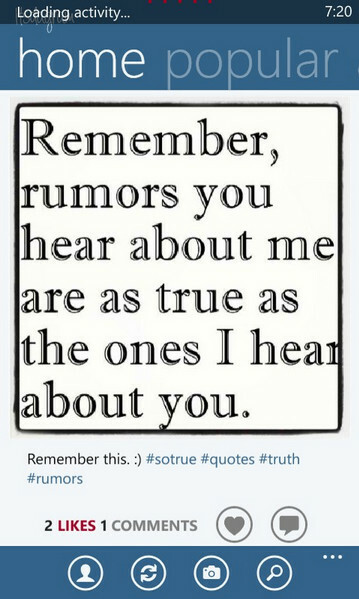 Daniel's filters are by no means ugly but - for me - they are hardly as pretty as the ones on Instagram itself. Anyway, it's alright. I mean, Nokia Lumia WP8 handsets - especially Nokia Lumia 920 and 720 - come with really great cameras delivering photos that look good even without filters. 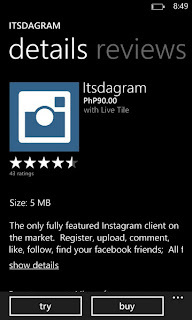 Itsdagram is now available on Marketplace for download on all smartphones running Windows Phone 8 operating. The full version sells for only Php 90 in the Philippines, which you can pay for using your cellphone load (It works with Globe, I've tried it myself.) However, you can always download and install the free trial or demo version first before deciding if you want to shell out some case for the paid version and reward the hardworking app developer and publisher.